The greater sage-grouse — a bird known for its fascinating mating dance — lives its entire life in the wide open spaces of the American West, stretching from the Dakotas to California. The sage-grouse's sagebrush habitat is also home to a variety of magnificent wildlife, including elk, mule deer, pronghorn, and golden eagles. The bird's population has plummeted during the last century, with more than half of its sagebrush habitat lost or degraded due in large part to unbalanced management of our Western lands. However, there is hope: We have the opportunity to save the sage-grouse, and your voice is crucial to ensuring responsible protections for the bird and its habitat. The Bureau of Land Management is creating management plans to guide conservation of the sage-grouse and its sagebrush habitat throughout the West. It will take President Barack Obama, Interior Secretary Sally Jewell, the BLM, and Western state governors working together to ensure that the BLM’s final plans provide adequate, meaningful protections while allowing responsible development. Please urge President Obama and other decision-makers to protect the remaining healthy sagebrush habitat across our public lands for the greater sage-grouse and other wildlife that make their home in these remarkable places. I want to draw your attention to a pivotal opportunity to protect the iconic Western sagebrush landscape and conserve the greater sage-grouse and other magnificent wildlife, such as elk, mule deer, pronghorn and golden eagles. All of this can be achieved while pursuing other priorities, including responsible energy development. The greater sage-grouse lives its entire life in the wide-open spaces of the American West. The bird's population has plummeted during the last century, with more than half of its sagebrush habitat lost or degraded due in large part to unbalanced management of our Western lands. Now the sage-grouse and its habitat are in jeopardy, and the U.S. Fish and Wildlife Service will determine whether to list the greater sage-grouse under the Endangered Species Act in 2015. The Bureau of Land Management controls approximately half of the remaining sage-grouse habitat, which stretches from the Dakotas to California. These lands support hundreds of species and local economies, but they must be managed wisely. 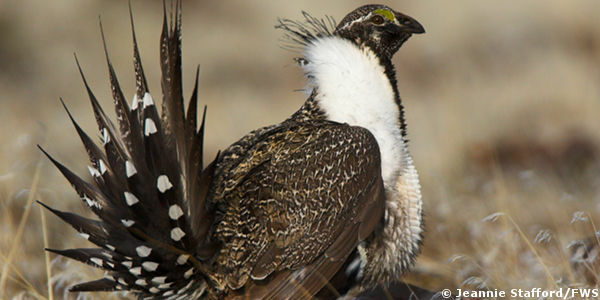 The BLM is developing plans to guide conservation of the bird and its sagebrush home in 10 states. I applaud the BLM's ambitious attempt to address the issue. But more needs to be done. The BLM's draft plans fall short of what is necessary to save the sage-grouse and conserve the lands where people hunt, fish and recreate. The BLM failed to incorporate conservation measures directed by its own scientific guidelines and to create consistency from plan to plan. The variations in the draft plans' management prescriptions create 15 different approaches to sage-grouse conservation within and across state boundaries and hinder effective, landscape-scale habitat conservation. The BLM must strengthen its plans so that it implements adequate, science-based conservation measures and provides consistency across the sagebrush landscape. The administration has an unprecedented opportunity to resolve this issue in a proactive, constructive manner. Please work with Interior Secretary Sally Jewell, the BLM and the Western state governors to issue final plans that protect the remaining healthy, sagebrush habitat so that the greater sage-grouse and other wildlife can continue to make their homes in these remarkable places.